Dallas County Judge Clay Jenkins said four dozen people being cleared off the Ebola watch list Monday should be treated with "dignity and respect" and welcomed back into the community. 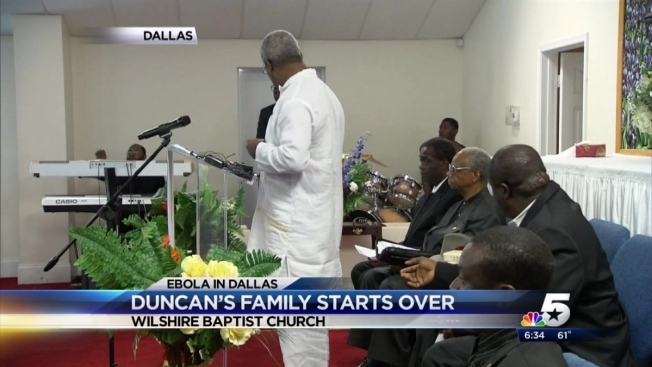 “There’s zero risk than any of those people on the list have Ebola,” Jenkins said. “We have to believe in science. It’s what separates us from other mammals." At midnight, 43 people showing no sign of the Ebola virus fell off the list and another five are expected to fall off sometime Monday. All of them either had direct contact with index patient Thomas Eric Duncan, or the ambulance that carried him to the hospital. The additional 75 health care workers who cared for Duncan will clear their 21-day monitoring period on Oct. 29. Jenkins singled out five children who are returning to school after missing about three weeks, and requested help from Dallas-area parents to ensure they are treated with respect. He said that Duncan's fiancee, Louise Troh, was worried about how her middle-school aged son would be treated, and he agreed with the concerns. He will return to Tasby Middle School Tuesday morning. “Middle schoolers are some of the most ferocious and scariest animals on the planet,” Jenkins said. For 21 days, Troh, her 13-year-old son and her two nephews were isolated from the world. They were ordered into quarantine at a property in Oak Cliff as health officials watched for any signs of them having the Ebola virus. “You can imagine what it’s like for anybody living under that threat and the tension of everyday,” said Catholic Diocese of Dallas Bishop Kevin Farrell. Their temporary house at the Catholic Conference and Formation Center was a single story, four bedroom home that sits in a gated community owned by the Catholic Diocese of Dallas. Jenkins and Dallas Mayor Mike Rawlings personally asked Farrell if the church could help after the county had to move the family from The Ivy Apartments where Troh lived. The apartment contained many contaminated items from Duncan. It took the bishop 15 minutes to make a decision. The family was moved and remained out of sight from the world during their quarantine. But now one challenge is over and another one begins. “I would hope that the whole community would kind of understand and bring them back into the community and be kind and compassionate and accepting to these people who have suffered in this way,” said Farrell. Troh lost most of her property at her apartment that had to be destroyed because they were contaminated. According to a press release from the City of Dallas, Troh will find an apartment or home of her choice within her budget in the next few weeks.The first six months of her lease will be funded by the church and local philanthropists. The organizations will also provide money for new clothes and personal items. Non-profits will assist with furniture, linens and kitchenware for her new residence. "The world is watching Dallas,” he said. The 43 people who were on the watch list after coming in contact with Thomas Eric Duncan, who died Oct. 8, before he was put in isolation have shown no signs of contracting the virus. “Continuous vigilance in confronting this threat and the cooperation of those affected is what has brought us to this point, and we look forward to the day when the remaining individuals can also be removed from active monitoring,” Texas Gov. Rick Perry said. The fight is not over, though. Nina Pham and Amber Vinson, two Dallas nurses who contracted the virus while caring for Duncan at Texas Health Presbyterian Hospital, remain hospitalized. Investigators said they don't know how or when they contracted the virus. All the other health care workers who cared for Duncan while in isolation are being monitored for 21 days. More than 70 of them will be closely watched until Oct. 29 as long as they continue to show no signs of having the virus. Jenkins said with each day that passes, the chances of another health care worker contracting the virus from Duncan decreases. If no new cases of Ebola appear before Nov. 6, North Texas will no longer be monitored for the virus. Around 120 possible contacts will remain on monitoring after the initial 48 are removed. In addition to the health care workers, airline passengers have been notified of possible Ebola contact from nurse Amber Vinson before she was hospitalized while she traveled to and from Ohio. A handful of people who sat within three feet of Vinson have been told to stay at home during the 21 day monitoring period.